These are the two Marquee venues, used mainly for general concert performances. Mumbulla is named after Mumbulla mountain, south of Cobargo and a landscape feature of significance to the Yuin people of the Far South Coast. Magpie, as well as being a well known melodious Australian bird, is also the name of one of our major sponsors, Magpie Music, who supply the sound system for this venue. This is the main Showground pavilion. Even though it is a large agricultural shed, we install heavy acoustic drapes which turn it into a fine acoustic space. It is named after Gulaga (Mount Dromedary), a mountain sacred to the Yuin people, just to the north of Cobargo, near Tilba. Our two largest venues are named after the two most significant mountains in the area. This was the Showground dining room. 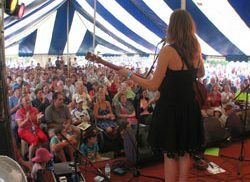 We use it for workshops and intimate concerts. 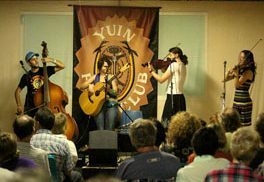 The Yuin Folk Club banner forms the backdrop to the stage. 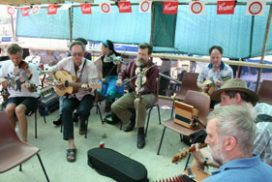 This venue derives its name from the Yuin Folk Club, which was named in honour, and with permission, of the Yuin Nation on the South Coast. The Yarnin’ venue is located in a marquee on the arena. This is where we hold the Poets’ Breakfasts, the “Ideas from The Edge” discussions and our blackboard. This is our Workshops venue. This pavilion was formally the old Brogo Fire Shed. We acquired this and relocated it to the Showground. It will be used for workshops. It is named after Narira Creek which flows through the Showground, just down the hill from the Narira venue. The Brolga is an Australian bird in the crane family that is well known for its intricate mating dance. As you have undoubtedly guessed, this is our Dance venue. 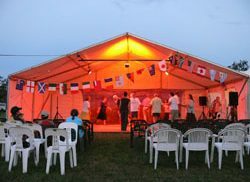 The dance venue will be operating from Friday afternoon and as well as the usual range of demonstrations and workshops. See the Dance Program page for details. 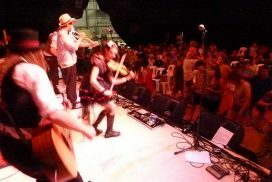 The Friday and Saturday night dances will be held at the COBARGO SCHOOL OF ARTS HALL, just a short walk from the Festival site, heading towards the village. This venue is dedicated to CHILDREN'S concerts and activities. Presenters are chosen who have experience with, and programs designed specifically for, the younger folk (generally under 12yrs). The venue is named after the mythical creature from Australian folklore derived from Aboriginal mythology and often featured in children's stories. 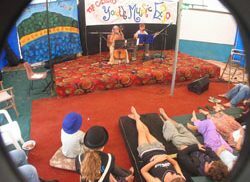 This is a venue dedicated to performances and workshops by and for youth (generally aimed at the 13 -21yr age group). 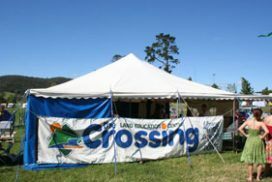 It is coordinated and hosted by The Crossing Land Education Trust, from which the venue derives its name. See our webpage on The Crossing venue for more information. The Bar and Festival Cafe are located in the central showground building. It is a licenced premise serving both alcoholic and non-alcoholic drinks. It is the hub of the festival, especially on a hot day. Naturally, this is where impromptu musical sessions happen day and night.